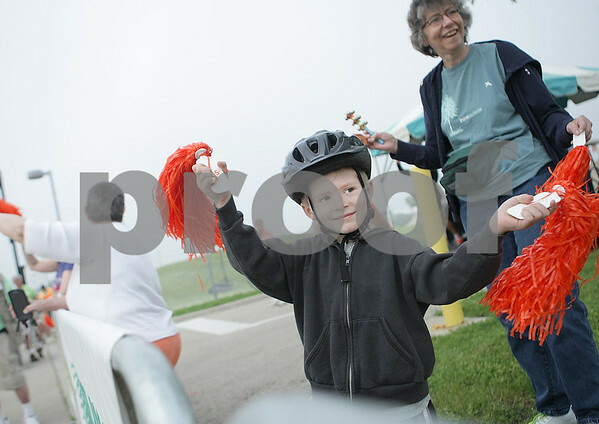 Five-year-old Sage McCue, of Montgomery, Illinois, and his grandmother Sue McCue, of Sycamore, cheer at the starting line of the 2014 Bike MS Tour de Farms at the NIU Convocation Center early Saturday morning, June 21, 2014. Sage's aunt, Sue's daughter, Carin Faust, orginally of Sycamore, was diagnosed with multiple sclerosis seven years ago. Sage raised $38.75 for Bike MS during a recent lemonade stand and hope to raise $100 before the end of the summer.